In general, a"heat map" is designed to give graphical representation to statistical data. It has different values displayed as colors on a scale from red to blue, red being the largest value (hot), blue being the smallest one (cold). Although, another color scheme may be used to represent values. 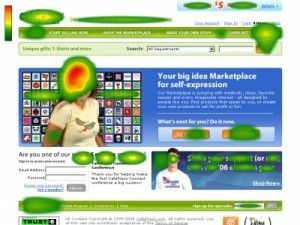 Eye-tracking charts that show what items on your page grab visitors' attention within the first seconds of viewing. 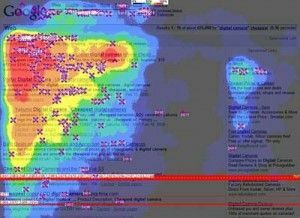 To create an eye-tracking chart, one needs expensive specialized equipment and immense human resources, thus, most webmasters use click density maps to identify popular areas on their websites. Also, a good place to stick an ad is immediately after an article, since very often people scroll down to see how long the article is or what comes next. 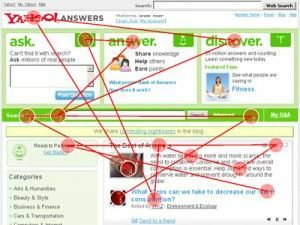 An eye-tracking study conducted by Jacob Nielsen revealed the prevailing reading pattern that most people follow during the first seconds of looking through a webpage. The pattern, when represented in graphics, resembles the letter "F", therefore the theory has been called the F-pattern theory. The experiment involved 232 users who were asked to look through thousands of webpages. The findings indicate that, at first, users normally read across the upper part of the page (the top bar of the letter F), then they move a bit down and read across the area that’s slightly shorter than the first stretch they looked across (the middle bar of the letter F). And, finally, they scan the left side of the page in a downward movement (the leg of the letter F). The "golden triangle" is an SEO term that applies to the most prominent area in SERPs. It has been discovered that the triangle-shaped upper left part of the average search results page attracts the most attention and receives the biggest number of clicks. This kind of explains why paid ads do not always work. A friend of mine owns a transport company, and, about a year ago, they decided to go techie and promote their website online. At first they put up a pay-per-click (PPC) ad on their target search engine. It did attract visitors, but not as many as they would like to get. Besides, they had to pay for every single click their ad received. So, my friend decided to change the strategy and strive for higher positions in SERPs. After a while they reached position 3 in their target search engine and started getting floods of traffic. How is this possible? One of the possible answers is: their paid ad had been sitting in the wrong place! Search engines post paid ads in different locations. Some place them within the golden triangle area, some in the much "cooler" area in the upper right corner of the page. So, it’s good to consider this, while purchasing a PPC ad. Besides, you can export data and generate reports, which is really awesome. Feng-GUI software is based on the knowledge of typical human attention attractors and prevalent viewing behavior. 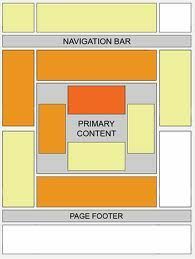 Your webpage is analyzed according to a certain algorithm, which reveals popular areas in your layout. Feng-GUI heat maps indicate what places on your page are most likely to grab visitor’s attention. Besides, Feng-GUI software also generates a scan path report that shows where users are likely to look first, second, third, etc. How does click-tracking software actually work? An HTML code gets embedded into the code of your webpage, which allows you to track clicks. There are certain online resources for technically savvy webmasters that provide code and guidelines on how to enable click-tracking on your website. For example, one of such do-it-yourself heat map solutions is offered by Corunet, a Spanish web consulting agency. In case you think it could be just the right idea for your website - here is the link . Ok, these were the 7 ways to draw a heat map for your website. As you see, you can consult those maps while deciding where to better place a link, a banner, a special offer or your most important information. Some heat maps also tell you what items on your website people will look at first, second, third and so on. If you’ve used click-tracking software or know other ways to make use of heat maps - share you experiences! Site Speed — Google’s Next Ranking Factor. How Fast is Your Site?